Spring through early summer is the critical feeding time for polar bears, regardless of where they live (see previous discussion, with references, here). During these months (February through June), the bears gorge on young fat seal pups to see them through leaner times later in the year – whether late summer ice-free period or mid-winter darkness. Figure 2. Female and cubs feeding on the ice. USGS photo. It’s a messy business, being a carnivore – especially for an all-white bear (Fig. 1). Polar bears would not be nearly so photogenic if they weren’t so fastidious about cleanliness, washing themselves off both during and after each meal. Take a look at the various ice maps below. The only area where the ice is lower than usual for this time of year (to an extent that might affect polar bears) is around Svalbard in the Barents Sea region, conceded by sea ice specialists to be largely a natural phenomenon. Figure 3. 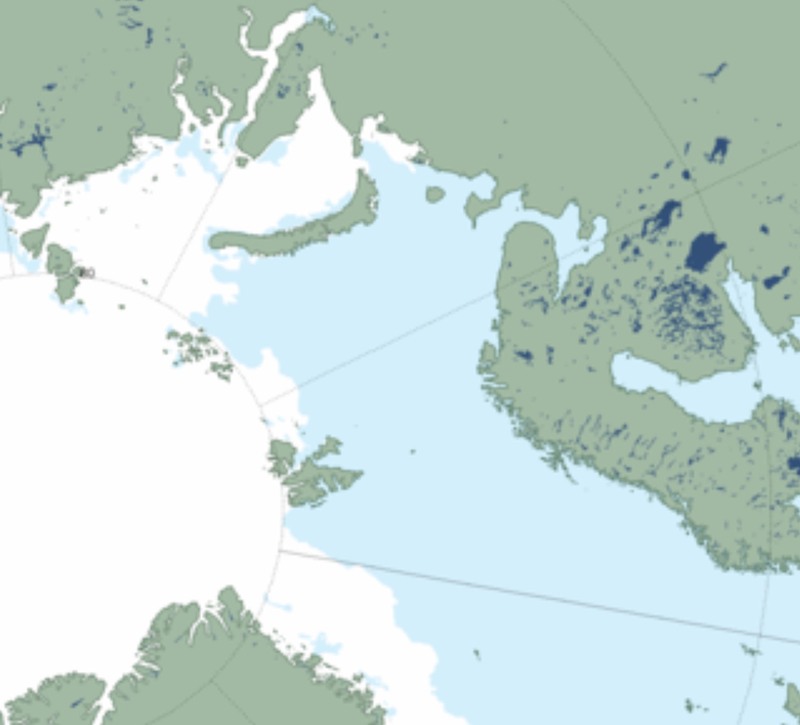 NSIDC sea ice extent at June 21, 2014 (a “MASIE” product), close-up of the Barents Sea region (Svalbard is the large island group in the center of this image, with the Franz Josef Land island group above). Click to enlarge. Figure 4. NSIDC sea ice extent at June 21, 2014 (a “MASIE” product), close-up of the Bering, Chukchi and Beaufort Seas, labels added. 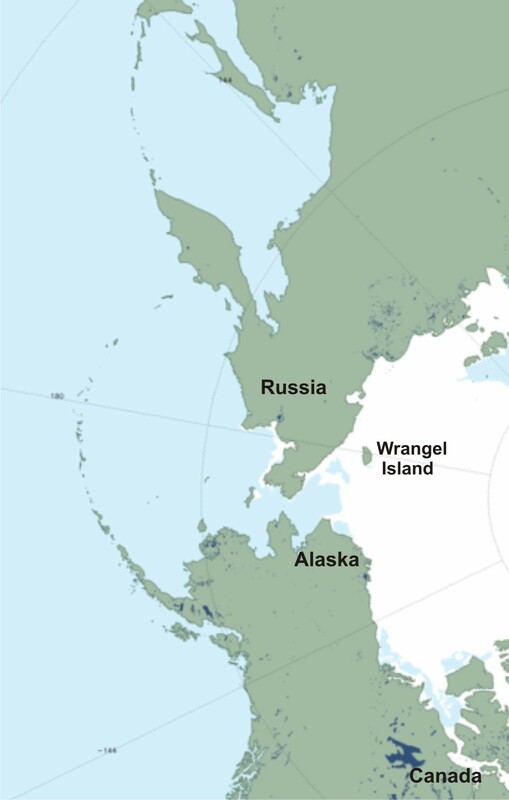 Note there is still ice around Wrangel Island (an important polar bear denning area) and lots of ice off the coast of Alaska. Bears in this area of the Arctic generally stay on the ice as it retreats – only a small percentage of bears spend the ice-free period on land. Click to enlarge. Figure 5. NSIDC sea ice extent at June 21, 2014 (a “MASIE” product), close-up of Hudson Bay. See additional maps below for more detail. Click to enlarge. Hudson Bay ice coverage is relatively high again this year, for this date – see the Canadian Ice Service maps below for 2014 compared to 2013 and 2012. Click to enlarge them. Figure 6. 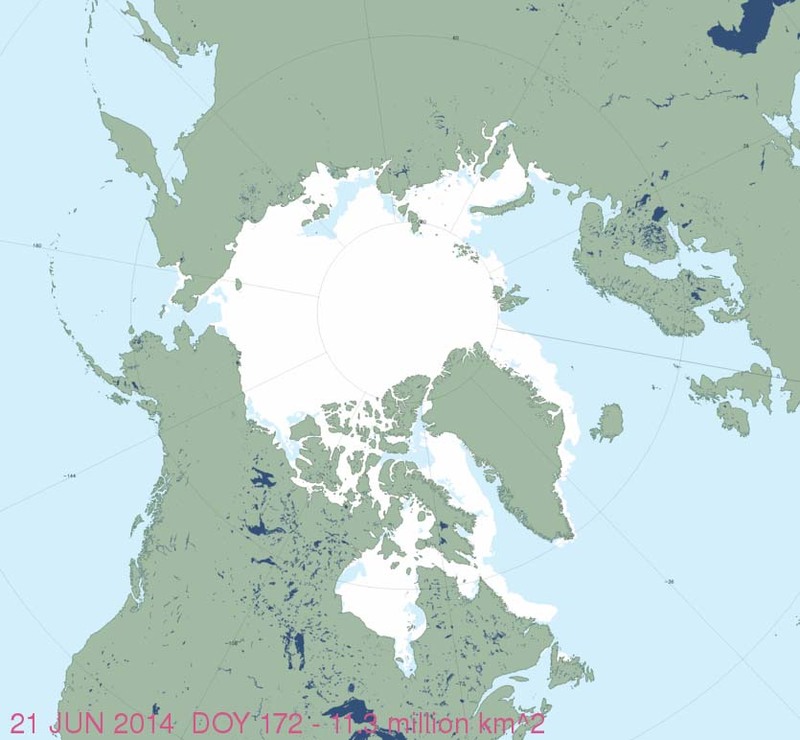 Hudson Bay ice coverage at June 21, 2014. Canadian Ice Service. Figure 7. Hudson Bay ice coverage at June 20, 2013. Canadian Ice Service. Figure 8. Hudson Bay ice coverage at June 20, 2012. Canadian Ice Service. 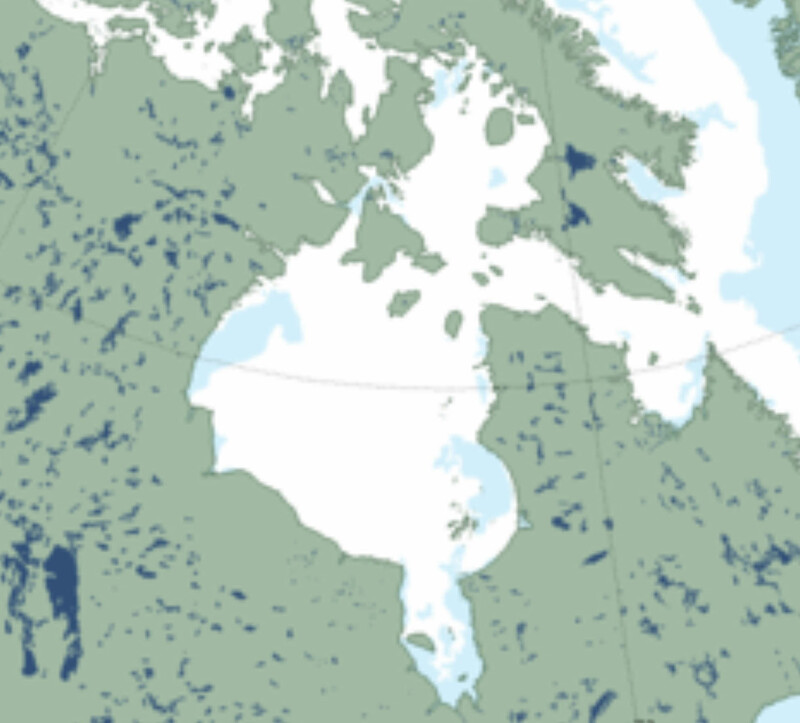 Also, below is today’s Hudson Bay map. Note that a peculiarity of ice melt in the bay is that the last of the ice to disappear is along the southwest shore. Figure 9. Hudson Bay ice coverage at June 24, 2014. Canadian Ice Service. 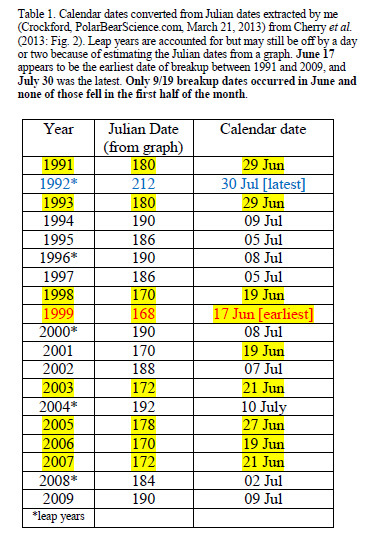 As the earliest date that Western Hudson Bay was reduced to 30% ice coverage between 1991 and 2009 was June 17 (in 1999, see detailed discussion here and Table 1 below), we are well past the point of an early breakup, since well over 50% ice remains today (to my eye, anyway). As polar bears in Western Hudson Bay have been shown to leave the ice about one month (average 28.3 days) after the ice declines to 30%, it suggests their summer fast this year will not start until late July or after. See the Western Hudson Bay breakup date table copied below, from that March 21, 2013 post. In other words, unless the ice melts very rapidly within the next couple of days, there will be no earlier-than-average breakup for Western Hudson Bay again this year and unless freeze-up this fall is very late (which it hasn’t been for years), polar bears of Western Hudson Bay will not endure a longer-than-average summer fast. 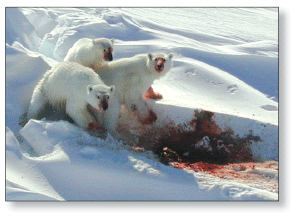 And given the conditions elsewhere, it seems likely the same will be true for polar bears throughout the Arctic. This entry was posted in Conservation Status, Sea ice habitat and tagged Chukchi Sea, critical feeding period, early summer ice coverage, Hudson Bay breakup, Jon Aars, polar bear, polar bear habitat, sea ice maps, spring sea ice, summer fast, Svalbard, Svalbard cubs, western hudson bay. Bookmark the permalink.